a turning point for a formerly fringe segment. Besieged by a sagging economy and governmental intrusion, tobacco retailers are glimpsing a guiding star in the East. Unlike the mystical biblical reference, however, this one is named "shisha." Shisha (SHEE-shah) is the historic Arabic name for the entire hookah smoking apparatus, including a globe full of water, tobacco, and charcoal for ignition. But, in contemporary usage, it generally applies to the smoking material alone - a small amount of tobacco combined into a sticky ball with flavoring agents, honey, or molasses, and a casing (usually glycerine). The lump is placed in a bowl on top of the hookah, a charcoal pellet is placed atop it and lit, and users puff the water-cooled smoke, through flexible hoses. Replaceable tips on the hoses assure sanitary usage, as hookahs are - like Marriott Hotel mattresses - communal. In one setting, up to a half-dozen may use a hookah simultaneously. Few smokers inhale, although the nicotine content may be as low as two percent of that in cigarette smoke. Instead, they smoke for the taste of the flavoring agents, usually fruit-based, with some instances of mint; menthol; spices like clove, anise or rosemary; or blends of complementary flavors. The rise of hookahs and shisha in America - which was still in its infancy two to three years ago - didn't originate in the marketing departments of tobacco suppliers. It sprang from a cult movement by college-age and twenty-something patrons who discovered this ancient Middle-Eastern pastime of smoking pleasure, along with a far more rewarding social and cultural substance. Cigar smoking captures this to a degree, but certainly not cigarette smoking. Young people are unmatched at extracting the most joie de vivre per dollar of any age group, which typifies communal hookah usage. They watched, aghast, as the price of premium cigars soared to $5-10. Now, instead of friends joining over cigars, hookah smokers can enjoy the same duration of relaxed companionship around a hookah. Depending on location, the tab will total $5-10 - but that's for the entire group. The attraction of hookah smoking extends well beyond economy. It's a solid subculture now, appearing all over the Internet. YouTube hookah videos - ranging from tutorials, chats, or criticism - are commonplace. Click on "Images" on Google, type in "hookah lounge decor," and you'll see blissed-out smokers, lounging on Persian rugs and overstuffed pillows. 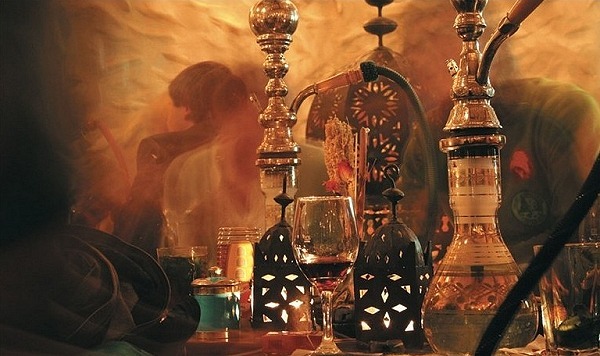 For the Western taste, there are also regular bars, with smaller hookahs sitting in front of patrons on stools. In contrast to cigarettes and cigars, hookahs offer a spectrum of sensory delights via imaginative flavors like cherry cola, pomegranate, and bananas Foster. Flavor choices run in the dozens. What young man wouldn't enjoy joining his first date in the communion of a hookah experience? Hookahs provide youth with worldly experimentation, enabling them to explore beyond their upbringing and Western culture. Hookahs allow them to immerse themselves in a foreign, exotic hedonism. Taken together, one can see the movement has blind-sided the industry with a demand that tobacco companies, from the largest to the smallest, are only recently satisfying. U.S.-based shisha suppliers are focusing on young American, rather than Middle Eastern, consumers. Anto Mahroukian, president of Los Angeles-based cigar manufacturer JM Tobacco, now produces shisha tobaccos. "The ethnic customer base is huge, but traditional smokers are accustomed to buying from traditional manufacturers," Mahroukian explains. "They are somewhat isolated from mainstream American products. They're difficult to reach. There may be some prejudice against new products that don't come from 'back home.' These customers buy their shisha at ethnic food markets, from only one importer." JM Tobacco debuted their shisha line at IPCPR 2008 and has been thrilled with the product's success in such a short time. With an active sales rep force and 1,200 retailers already selling JM Dominican cigars, shisha is doing well for JM. "There is room to move into the ethnic market, if we see activity, but not now," notes Mahroukian, who instead has focused on his established base of traditional tobacco shops. "We're very pleased with our 40 percent growth over last year's show," has says. "Last year's retailer hesitancy was due to their perception that water pipes implied illicit usage. But, thanks to education by customers, our rep force, and the Internet, shops are losing their intimidation by hookahs' 'strangeness.'" Shisha is classified as pipe tobacco, so it enjoys a favorable tax status. "Now that smokers are requesting shisha in droves, retailers are awakening," he adds. Paul Creasy, general manager of the Pipe Tobacco Division of Altadis U.S.A., serves as chairman of the Pipe Tobacco Council, and has watched the import figures for pipe tobaccos increase: between 2002 and 2003, U.S. imports of Egyptian and Jordanian tobaccos quintupled, from 20,000 to 100,000 pounds, he says. "By 2007, our imports skyrocketed to two million pounds. This was not due to an increase in consumption by existing Middle Eastern residents in the U.S., nor by a flood of new Middle Eastern immigrants," Creasy explains. "It was new American smokers. This amazing growth prompted us to bring our Jewels Molasses brand of shisha to IPCPR 2008, becoming the single best new product category in the history of Altadis." Over 1,000 retailers came aboard - almost overnight. Creasy says hookah bars are the company's target accounts, especially near top college campuses, with night clubs and bars running a close second. "Our research and results show the market is driven by that demographic segment," saus Creasy. "Now, 95 percent of end users are American, compared to only 10 percent in 2002." With a market only three years old, virtually no promotion by any manufacturer, and limited distribution to ethnic food markets, brand loyalty didn't exist in the shisha segment. "We saw an opportunity in the tobacco distribution channel for a top-quality product with polished packaging and innovative features," says Creasy. "With 300 salesmen nationwide, plus our reputation as a major manufacturer, retailers and smokers feel safe with Altadis. Compared to imported shisha, Altadis offers top quality, all-important consistency, branding, national promotion, POP promotional material, and customer support. Being American-made, our shisha is 'mainstreamed,' making it easy to find, with immediate deliveries of fresh product. Hookah smoking is not a fad...it's a trend." Most recently, National Tobacco, Inc., of Louisville, Ky., announced at IPCPR 2009 it would be entering the segment as a distributor of two established shisha brands: SoeX, made using ground sugar cane stalks instead of tobacco, and Afzal, a traditional tobacco-based shisha, both made by India's largest shisha company, Sopariwala Exports. National has delayed its planned distribution of the products; watch for future announcements of its availability. George Bittar, owner of Las Vegas tobacco importer/distributor Ideal Tobacco Wholesale, began selling Egyptian and Turkish shisha in 2002, mainly to tobacconists and hookah bars, due to his Middle Eastern background. "The real growth started in 2005, and we have seen a greater annual sales increase than in cigars, cigarettes, and other tobaccos," says Bittar. "We have seen smokers and retailers become more knowledgeable over the years - even customs officials are less scrupulous, now that they understand shisha. It's no wonder the pastime is so popular. For watching a game, just talking, relaxing and having fun, hookahs are the perfect focal point." Jewels Molasses shisha from Altadis U.S.A. (800-683-8800) is available in twelve flavors, including four new ones for 2009 - Apricot, Passion Fruit, Sweet Melon, and Orange. They are packaged in 50 gram boxed pouches ($3.20 suggested retail, including federal excise tax) and 500 gram cans ($17.00), both resealable. Each container includes a personal flavored tip to match the shisha, ensuring sanitary usage. The flue-cured tobacco is grown in the Far East, and is a variety in the Virginia family, washed for purity of flavor. 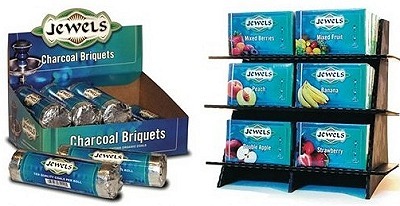 New Jewel-branded Charcoal Briquets are now available as well. 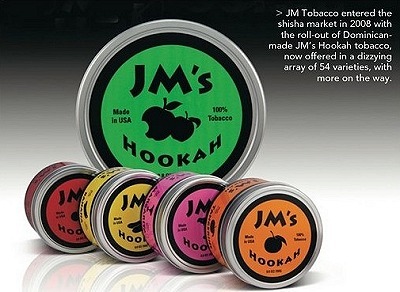 JM's Hookah from JM Tobacco, Inc. (888-377-2667) comes in no less than 54 flavors, with more coming. Watch for their new Chai Spice, which uses black tea leaves instead of tobacco for those averse to the latter. Their select Virginia tobacco is grown in that state, and the blending and flavoring is done in Los Angeles, making it an all-American product with no import taxes. Suggested retail prices are $9.00 for the 100-gm cans and $15.00 for the 250-gm cans. They use honey for a binder, considered the best for hookah tobacco. Kretek International, Inc. (800-532-4427) offers Rosetta, specially made for them by their supplier's Syrian master blender. It is also honey-based, and available in sixteen flavors in 50 gram ($2.99) and 250 gram ($12.99) cans. The company's Phillips & King International distribution division also sells Al Faahkir, a Middle Eastern imported shisha; Pharaoh's, a U.S.-made brand; and EZ Hookah tobaccos. Metro Tobacco, Inc. (313-927-7150) manufactures 28 flavors of shisha. According to Hatch Albert Kardashian, the company principal, their shisha is U.S. made from top-quality tobacco, using only FDA-approved flavoring agents. Of the flavor lineup, the EZ disposable "Poke and Puff" packaging is a pre-measured and -mixed shisha in a foil-wrapped puck, sized to the hookah's bowl. One punctures the top and bottom of the foil (pin thoughtfully enclosed), sets it in the hookah's bowl, and places glowing charcoal on top. Disposal is equally easy. There are also many other small shisha companies that sell packaged and private-branded bulk shisha from the Middle East and serve primarily local or regional markets, so consider checking your local sources.